Beauty From Ashes: Edwardian "S" Bend Corset!! Well, I just can't stand it!!! 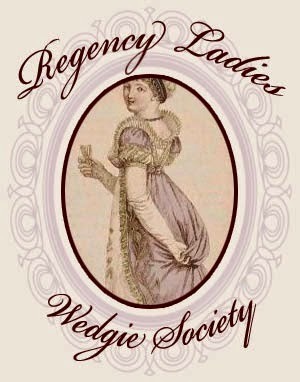 This hiatus from sewing. It is driving me absolutely crazy!!! I have attempted to start a sourdough starter to no avail and blew up my kitchen trying to make homemade mayonnaise....I think I need to get back to sewing and stay out of the kitchen for a bit. 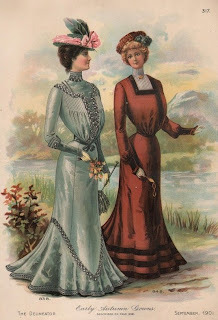 So, I am going to do something sewing-wise today, just a little bit of something....I am going to start my Edwardian "S" Bend corset. 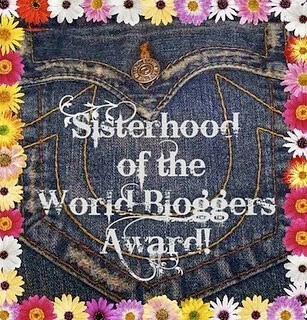 I have wanted one for a while and my dear friend Josie said she would make me one, but she is busy making one for herself, my Mama and I think her daughter...I really don't want to bother her. And I need it soon. So, I am going to just bite the bullet and make my own! I have made 7 corsets using Simplicity 9769 and I absolutely LOVE it!! I can get away with using it for the First Bustle through the '90s eras....but....that is where the compatibility of this corset and eras ends. Simplicity 9769....a great corset for beginners and those who just need a good "go to" corset pattern. 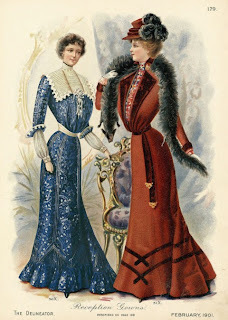 In the Early 1900s also known as the Edwardian Era (as King Edward finally got his chance to sit on the throne of England) the silhouette of ladies dresses changed in a most peculiar way. The bust blossomed into a "pouter pigeon" front and the derriere thrust backward, causing the shape of the lady to look like an "S". In the above two fashion plates you can see the exaggerated shape of this new silhouette! Some say that is ridiculous, others such as myself think it looks very lovely and elegant! I especially love the shape of the tulip skirt and the flare of the flounce. 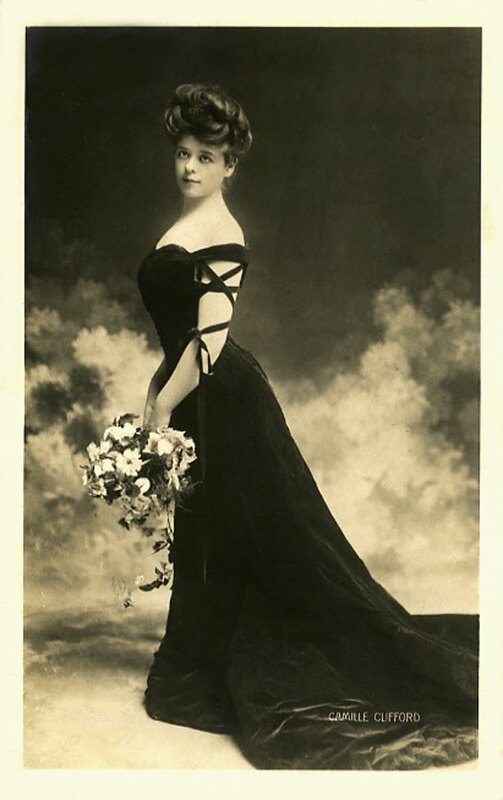 "In the early 1900s she won US$2000 in a magazine contest sponsored by illustrator Charles Dana Gibson to find a living version of his Gibson Girl drawings: his ideal woman." 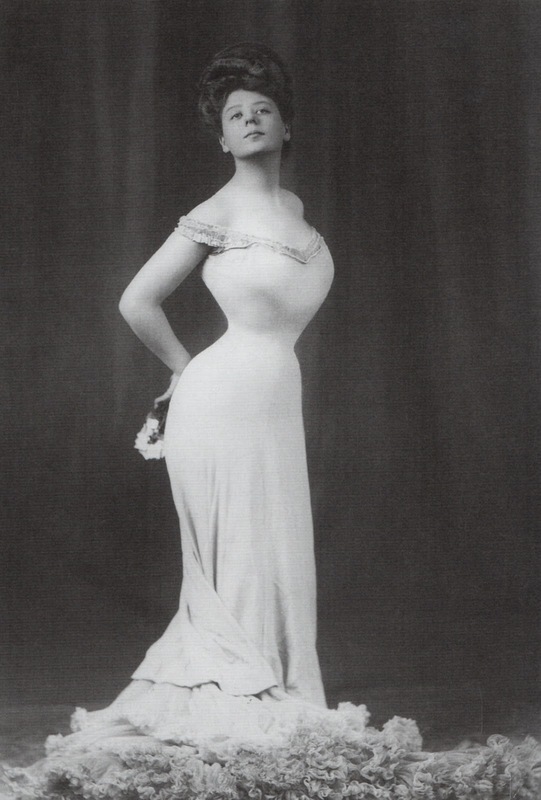 To attain this shape, the corset in the early Edwardian years had to change....no longer did it just have to cinch in the waist and hold up the bosom, it had to alter the whole dynamic of...well everything! The derriere and shoulders were thrust backward, the head had to be held differently and the bosom had to stand out there all proud like, and I am sure the muscles surrounding the spine were a bit on the grouchy side until the body could get accustomed to this new way of....well....being. Wow. 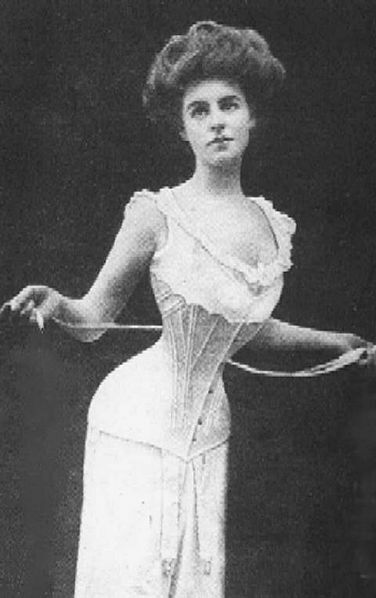 A lovely lady wearing the corset that changes the way ladies stood. 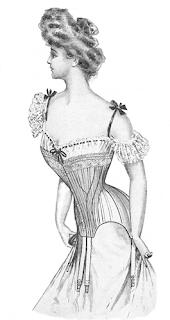 Now I am sure that not all ladies took this severe stance when wearing this corset. And I am sure that there were ladies that took this shape to the extreme. It is like today. The fashion designers put an idea out there and we have the choice to follow it to the letter, follow it sort of , or say "OHMYGOSH...what were they smoking when they thought up THAT idea?" Since I am wanting to make outfits that resemble the spirit of the early Edwardian era, I am going to attempt to capture the quintessential Gibson Girl look. Enter the Truly Victorian Edwardian Corset. It is so beautiful! 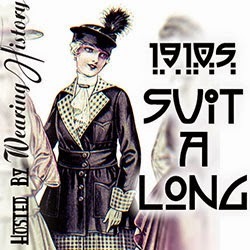 With all the lovely swoopy lines (I am used to working with fairly "straight" lines) and the just gorgeous over all look of the corset. Today I will be tracing the pattern out in my size and making a mock so I can see how it fits and also the size of bones I need to order. I already have a 13" busk, so that is a good thing. Then I need to decide on what color I want it to be. 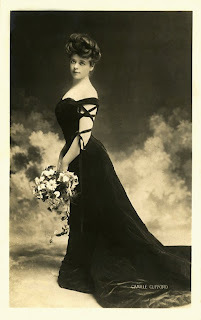 I really want a black Edwardian corset, but I am not sure. Just not sure....I guess I have a few days to think about it. At least until the steel gets here!!! Ok, so off I go! "To the sewing room Batman!!" hahahaha!!! See you soon! Those daring women of fashion! I firmly believe that with grace, patience, knowledge, talent, creativity, love, and in many cases a whole lot of God, anything and everyone can be turned into something beautiful. Be it brand new raw material, cast off, forgotten, unloved, broken, ugly, or sad, with loving hands, perhaps a pattern or idea, kind words and compassion, all things can be made new! That is what is so exciting isn't it? Watching the journey from ashes to beauty unfold. ©Beauty From Ashes 2011-2016 NO IMAGES OR CONTENT MAY BE USED WITHOUT EXPRESS PERMISSION. Any photographs, content, or images shared on this blog are ©Beauty From Ashes, unless otherwise noted or sourced. Many images are based on Public Domain materials, or I have acquired permission to use said images on this blog. If using images or content from this site for reference material, please source back to this site and give credit.